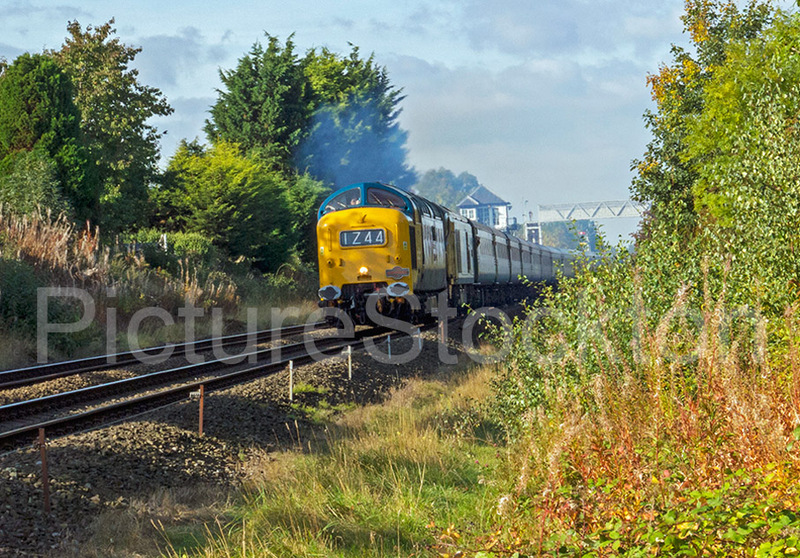 A preserved Class 55 locomotive D9009 ‘Alycidon’ on the ‘Deltic Deviator’ rail tour powering through Norton-on-Tees signal box, Saturday 29th September 2014. Photograph and details courtesy of Alec Moody. I started on the footplate with British Rail at Kings Cross in 1973 as a secondman later transferring to Gateshead as a relief driver. These locomotives did their job with power to spare. However having driven them extensively over the East Coast Mail Line I can honestly say that they were not the most comfortable or quietest locomotive to drive. In the Winter they were very cold with draughts in the cabs. It was a relief to get off the locomotive at Kings Cross after working an overnight sleeper with 5 to 6 hours in the cab. I was recently on the “Albert Gilmour Memorial” charter with Alycidon being the motive power. It was still capable of 100mph running, a speed it reached with comfort during the run from Newcastle to Kings Cross. Albert Gilmour was a well respected driver at Gateshead. The Year is wrong it was 2018 not 2014, the Class 68 behind the Deltic hauled the train to York, where Alycidon was put on the front. D9009- later 55009 – was named ‘Alycidon’ on 21 July, 1961. It was one of eight Deltic locomotives allocated to Finsbury Park Depot, London. All of the London based locomotives were named after race horses, maintaining an LNER tradition. Six Deltics were also based at Gateshead Depot and eight at Edinburgh (Haymarket). These were named after army regiments, eg D9017 ‘Durham Light Infantry’, though the last one did not actually receive its name until 1965. The 3,300 h p Deltics, with a loco weight of 99 tons as built, each powered by two 1,650 hp Napier Deltic two stroke diesel engines, were streets ahead, performance wise, of the heavy, underpowered diesel locomotives introduced by B R in the late 1950s and revolutionised performance on the East Coast Main Line. The Deltics were the greatest of the single loco class of diesels, but not perhaps anymore reliable than other designed and built in the 1950s, There were many occasions, waiting at Darlington, for a train down to London and then finding it to be delayed. A puny Class 47 had been substituted for the Deltic, making a late arrival into Darlington inevitable. Further delays occurred all the way down the line, getting into London an hour late. When this locomotive first entered service in 1961, it was unnamed. I was a dedicated “spotter” then and saw 9009 Regularly, probably at York. Normally a steam enthusiast, but as diesel locomotives became more common on express services, and steam declined ,us “spotters” began recording diesels. My summer 1961 combined volume had 9009 unnamed, but by winter 1962, it had received the name Halycidon. I’m not sure how many of them were constructed, but my winter 1962/63 combined volume, shows twenty two, with only nine named. These locomotives were designed to replace the top link steam locomotives, such as the A4’s, on the East Coast main line. A slightly earlier class, the type 4 “Peak” introduced in 1959, had already made inroads into the operating diagrams of the steam powered express services, and in some parts of the Eastern region, had replaced steam completely by 1962. David, thank you for the fascinating background information, do you know what is the sign over the buffer, was this a special excursion? Not sure What that sign is Cliff, but I would suppose this was a special excursion. Most signs relating to the excursion itself, would have been more prominent. I know that excursions hauled by preserved locomotives on main lines, have to abide by certain conditions, but whether the sign relates to that or not, I’m not sure, but the shape suggests not. Perhaps someone else can shed light on that sign.